"I can feel the darkness. This is the world I wanted to create." Day Of Reckoning is the final volume Arc The Lad, wrapping up the whole story in 5 emotional episodes. Many things have changed in the series, especially character attitudes, and it all comes down to a final battle with ultimate evil. While a few story details are vague in this final volume, the overall impact of the series is so fantastic, that the minor flaws go virtually unnoticed. At the end of the previous volume, things looked rather grim. Despite a series of victories, Arc, Elk, Kukuru, and the rest of the freedom fighters face a difficult situation. The young girl, Lieza, is kidnapped by Clive and the remaining members of the Nameless Crusade, and as it turns out, she has the power needed for the evil Lord Andel to open the Holy Ark, the coffin that has sealed an ancient evil within it. Elk has had a major change of heart. He has discarded his feelings of revenge and anger for a refreshing attitude of hopefulness in the future. He no longer wants to kill and destroy the enemies that darkened his life, but simply wants to save Lieza's life. No longer will he act on his own; he understands he's part of a team under the leadership of Arc. All of them bind together with one goal: rescue Lieza from the hands of Clive and keep the Holy Ark sealed. If it means death, it means death, but they refuse to accept defeat and they refuse to entertain thoughts of having to kill Lieza to stop her from opening the Ark. Meanwhile, Clive and Lord Andel set up their future plans. Clive is still a mysterious character, but unlike previous volumes, this one actually give him a bit more personality. We see more of his emotional state, but unfortunately it's just as dark and evil. Lieza is intended to become the next Holy Mother (the being that gives birth to the Chimera monsters Lord Andel uses to subjugate the world), but as it turns out, Lieza's spiritual power is too great for her to become the Holy Mother. So, Clive has other, more sinister plans for using her. Hypnotized by his power, Lieza can do little to fight back, making Elk's rescue attempt harder than it has to be. There is one final confrontation left and no turning back for any of these characters. Arc The Lad keeps its drama just as taut as ever, but the final 5 episodes feel even more solid, thanks to the clever writers, who knew what they were doing when they started Elk out as a brash, unlikable character. He slowly involves into a more mature person, and now he no longer functions as the "angsty", bitter warrior with a dark past. Instead, he becomes the hero we want him to be, almost overshadowing Arc's personality. The level of intense emotion in this series is also part of what makes it masterful to me. Just as I was blown away by the events of disc #4, the full-circle of the story feels very complete, now that we have a similarly powerful ending. Like many of the best of stories, Arc The Lad doesn't capsulize a simplistic ending, either. When the final credits roll, there is still much left undetermined, and the future is, indeed, uncertain. 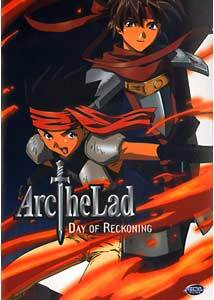 Of course, the core of the plot is taken from the video game, Arc The Lad II, implying it is possible another series could be developed from Arc III, which takes place many years later. Even so, I'd like to think of Arc as a world unto itself, not particularly tied into the specifics of the games. I can officially say that this series is the best fantasy-based anime I've yet seen, creating characters that you really get to know and care about. When viewed completely, Arc also has a strong message about fighting to protect and save things rather than for revenge; the heroes become stronger and more noble when they put aside their hatred and act for greater ideals. This is something I think everyone can appreciate. Image Transfer Review: There are no substantial issues with the transfer, which looks crystal clear without even a hint of compression artifacts or pixel movement. Some scenes have slightly grey black-level, but it seems related to the nature of the background paintings more than any kind of problem with the source print. It is pristine animation, typical of the series in general. Audio Transfer Review: The 2.0 soundtrack mixes in a few sparse surround effects, but mainly roots itself in the front speakers. Depending on the action, things can get nicely theatrical, but this volume of Arc The Lad leans towards the dramatic side. It delivers when it needs to, and keeps everything audible and perfectly balanced. The English dub works well for a dub, and doesn't make radical alterations to the source story. Extras Review: There are no real features other than additional ADV previews. Unusually, the main menu, as well as the languages menu, are extremely blurry, but it's nothing major. Arc The Lad is a superb series, filled with just about everything that makes a fantasy story good. It mixes excitement with heavy drama in a way I've rarely seen anything animated be able to handle this well. Whether rented or bought, it is in the upper ranks of Japanese animation, without question. Again, those interested in the games should keep an eye out for the Arc The Lad Collection (all 3 Arc Games plus Arc Monster Arena and loads of extra goodies) being released soon from Working Designs, who are now finally taking pre-orders for the title. They take some time to put material out, but when they do, the time spent on it definitely shows. It has also recently been announced that Sony Computer Entertainment has an Arc 4 in the works. If a future anime is produced, I pray the team that created this original incarnation return for the next.